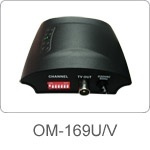 • Convert AV signals into normal TV signal. • Suitable for the home distribution of any audio visual equipment. • Can adjust the output channel. • Build-in amplifier to compensate transmission loss.